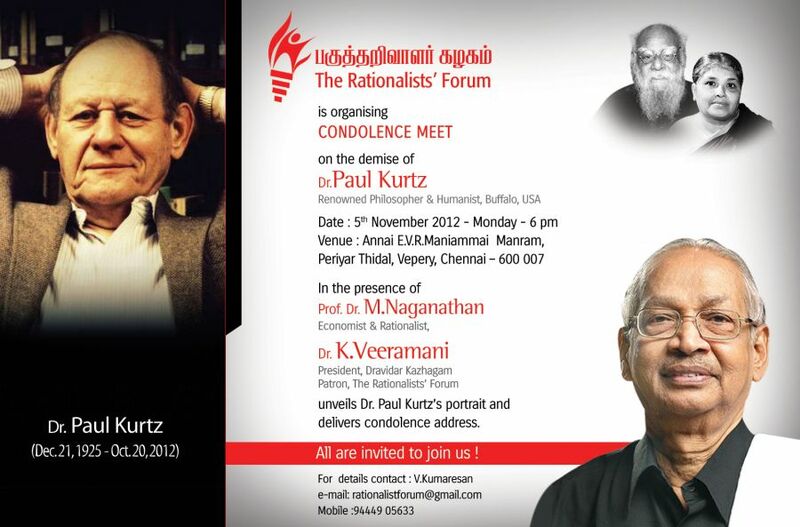 Dr Paul Kurtz (December 21, 1925 Newark, New Jersey, U.S.A – October 20, 2012) was a prominent American skeptic and secular humanist. He has been called "the father of secular humanism". 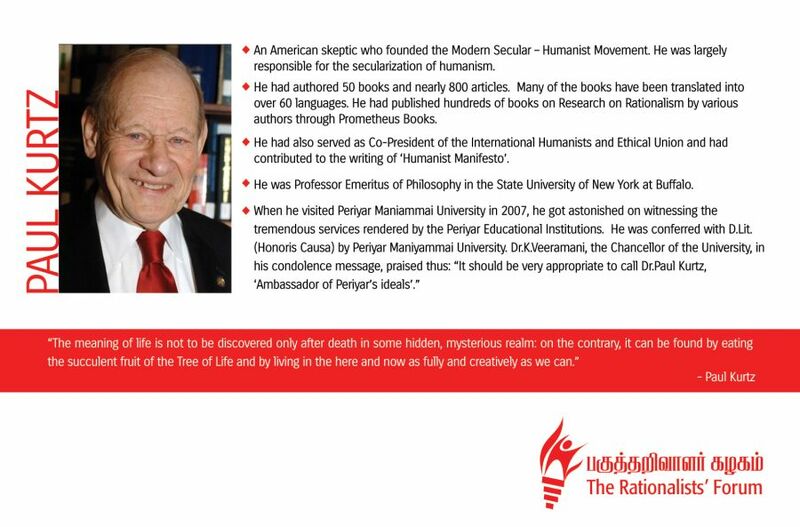 He was Professor Emeritus of Philosophy at the State University of New York at Buffalo, US. Kurtz founded the publishing house Prometheus Books in 1969. He was also the founder and past chairman of the Committee for Skeptical Inquiry (formerly the Committee for the Scientific Investigation of Claims of the Paranormal (CSICOP)), the Council for Secular Humanism, and the Center for Inquiry. Kurtz published over 800 articles or reviews and authored and edited over 50 books. Many of his books have been translated into over 60 languages, including Indian languages. They include The Transcendental Temptation, Forbidden Fruit: The Ethics of Secularism, The Courage to Become, and Multi-Secularism: A New Agenda. In memory of this great humanist, Rationalist Forum, Chennai is organizing a condolence meet on November 5, 2012 at 6 PM at Annai-EVR-Maniammai Manram, Periyar Thidal, Vepery, Chennai- 600007.